The Basilica Notre-Dame de la Garde in Marseille. Astrology, astrogeography and magical places. 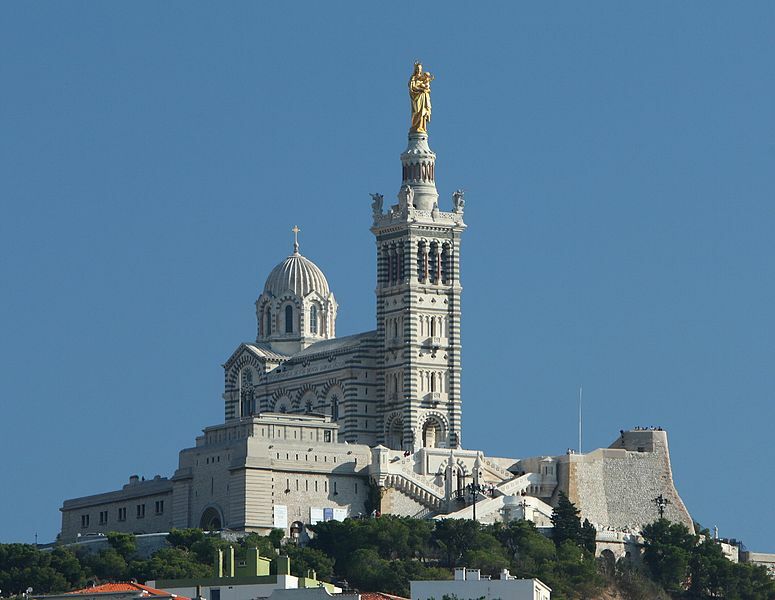 A famous landmark located on a hill above the old part of the City of Marseille, France is the catholic basilica Notre Dame de la Garde – Our Lady of the Guard also called “La Bonne Mere” (the good mother). 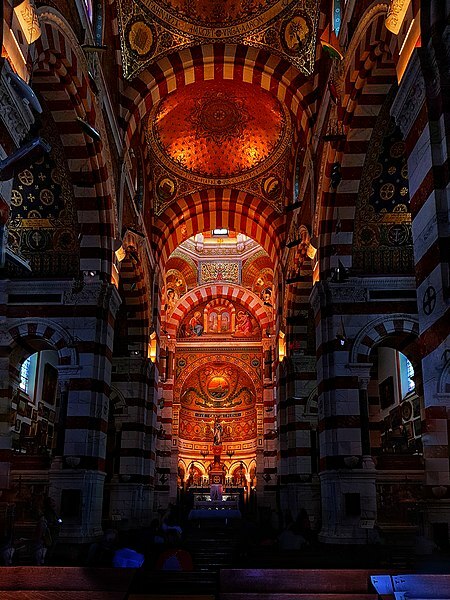 Notre Dame de la Garde is dedicated to St Mary. A square 41 m (135 ft) bell tower topped by a 12.5 m (41 ft) belfry supports a monumental 11.2 m (37 ft) statue of the Madonna and Child made of copper gilded with gold leaf. The church sees 2 Mio. visitors per year. The construction site lies near the old city area but on a 143 m hilltop. Due to its proximity to the coast, the hill became an important stronghold and lookout point, Construction of the basilica was begun in 1852 on the site of an early 13th century chapel. It was consecretated on 5 June 1864. Astrogeographic position for morphogenetic field level 3 which describes the atmisphere and energetical topic of the site and how it is embedded in the landscape:: one coordinate lies in solid, defensive, conservative earth sign Capricorn sign of control, mountains, rocks, government institutions, guards and resonator for the exposed position on top of a mountain and above the city. As the sign of the guardians and rulers of society Capricorn stands for the name of a church as of the Guard and for the function of the prominent rock formation here as a stronghold that control the city area. The 2nd coordinate lies in self-protective earth sign Virgo sign of virgins, celibacy, reason, health, medecine, healing, self-cleaning and an important resonating aspect for the Virgin Mary often found at pilgrimage sites related to healing and saving miracles. The combination of two earth signs can be understood to have supported the energetical impact of the site as a place remembered by sailors as safe and dry ground when they were out in stormy weather. Compare the Lighthouse of Alexandria the prototype of all lighthouses in 2 earth signs.